Koryo University squares off against Yonsei University in soccer (football). 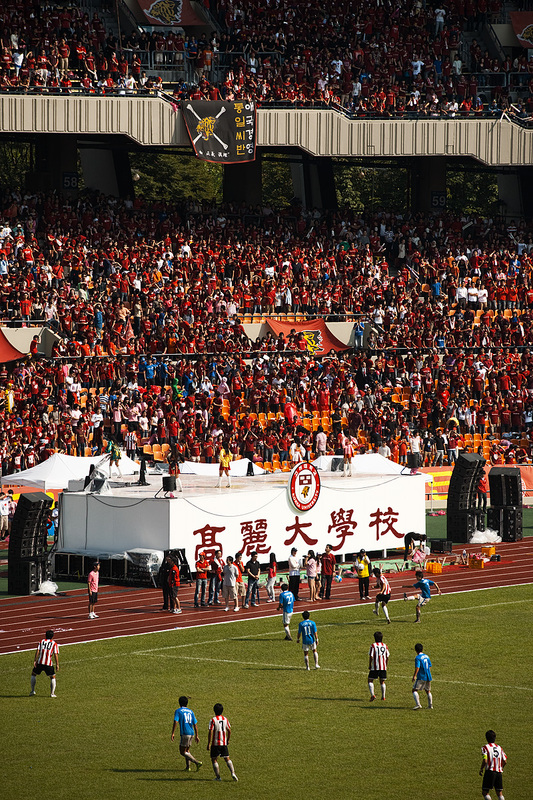 In the background, the fanatical Koryo U. student section cheers on its school. A bit similar to the Havard-Yale sports rivalry, this event is part of a long-standing tradition between the two universities to face off annually in a frenzied day of sporting events that include soccer, basketball, baseball, ice hockey and rugby. The pace of the day is frantic and the set cheers at each venue are raucous and deafening as you'd expect from energetic college kids. Unlike our (American) NCAA sporting events, drunken hooligans did not rule the day nor were there any violent fisticuffs or neck kicking in the stands. The only rather unfortunate part of the day was the sight of some male students in colorful spandex pushing the limits of Korean decency. Zoom around the photo to find these nutters. As for me, I don't quite have the energy for this young whippersnapper stuff anymore. I sat in the alumni section with the faculty/staff and elderly alum who, like me, were nursing their hernias and arthritic knees, meanwhile shaking our fists at the young'ns to keep the noise down... dang nabbit! Mouse over the image to move the magnifying glass (Flash Required). It really takes less than 1 minute. Voting ends December 15, 2009. Thanks a bunch!